paleo criticism Archives - PaleoMunch! I have read many articles online about the paleo movement. Most are positive and seem to understand the benefits of following a high protein, high fat diet and whole hartedly support it. Others, and most of them I have found are unfortunately articles written in an inflammatory tone (hehe, get it), are flat out against everything paleo teaches. But then you get those few who just seem to be hell bent on trying to tear down something which mostly they posses insufficient knowledge to comment. It appears as though in many cases, certain websites publish articles on how the paleo diet can “negatively effect” your diet have an unspoken agenda of created publicity of said article through the instigation of a flame war. This is totally unacceptable, and we should really stand fast and take the abuse head on. Nip it in the bud, so to speak. I totally get that there are some pro-paleo people (and I’ve probably done this on the odd occasion) who try to impose their beliefs and knowledge of dietary optimisation onto other people, but I am pretty sure they are insignificant in number to the “other side” of nutrition advice. A good real world example of this occurring is on sites which cover a multitude of subjects, niches and viewpoints. I don’t really understand how one site can be pro-multiple view points, but whatever. Anyway, these sites generally have an army of authors which are, to my imagination, prescribed work loads in the form of articles. The articles are in essence their products, and my oh my are some of them of shoddy workmanship. This article is one of many that I have found. Fortunately, it appears that more and more people are enlightened of the evils of grains and eating bad fats (trans fats) as reflected by the comments. The most monumental screw up in this particular article though is perhaps the confusion of ketosis and ketoacidosis by Berna Harmse, a “registered dietician”. Interestingly enough though, she isn’t to blame. More than likely she is misquoting what has been taught to her in her “dietetics” training. Either way, she inaccurately describes the way in which ketones are used in the body and rather than explaining their function, alludes to their potential for bodily harm, which, as you may already know would be difficult to achieve. You would probably have to starve yourself. I must appologise for the less than positive position of this article, but I strongly feel that if the media keeps pushing the same crap down peoples throats both literally (through eating) and figuratively (through the spreading of lies and half-truths) then those who aren’t searching for great dietary advice and merely are accepting of what is told to them will always be on the trailing edge of healthy lifestyle. It is our duty to defend what we know is healthy, right and accurate. Luckily for the paleo/primal movement, we have some great voices out there. 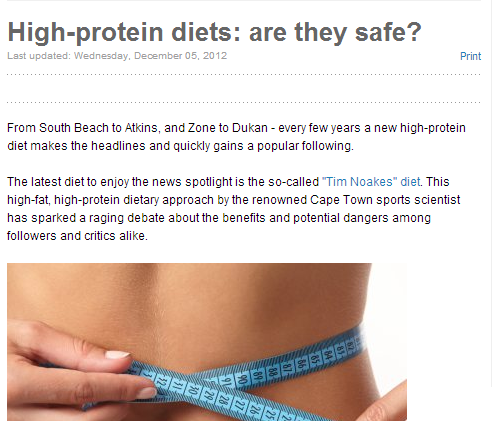 Remember people, there is a Professor in front of Tim Noakes title, he didn’t get that from guessing what was right. He actively tries to prove to himself firstly, and then the world what constitutes a healthy lifestyle, through eating, exercise and everything else.